Heat oven to 375°F. Separate dough into 8 rolls; place, sides touching, on ungreased large baking sheet to form wreath shape. Bake at 375°F. for 12 to 14 minutes or until golden brown. Meanwhile, add food colour to icing; blend well. Carefully remove warm wreath from baking sheet; place on serving plate or tray. Cool slightly. 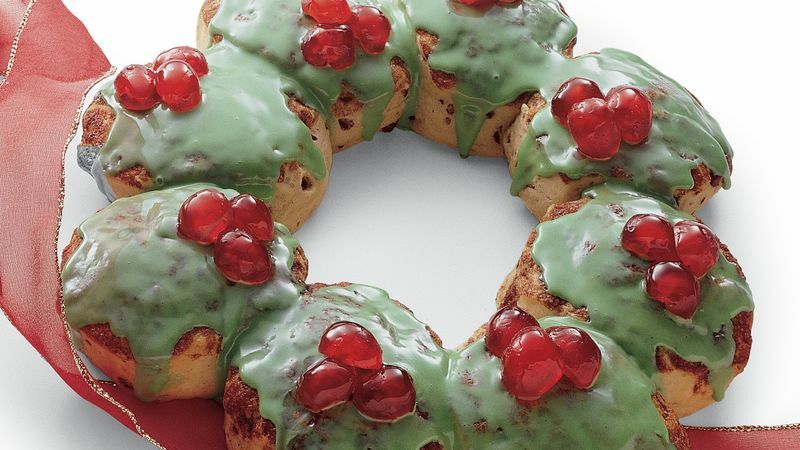 Spread icing over wreath. Decorate each roll with 3 cherry halves.